Leonard Bishop was a gregarious best-selling novelist, writing teacher, and newspaper columnist. He wrote passionately for fifty years, continuing until two weeks before his passing in 2002. 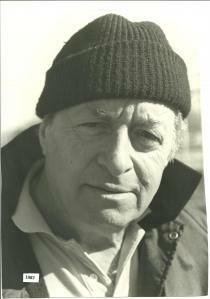 Leonard Bishop was a colleague of Mario Puzo, William Styron, Joseph Heller, Richard Wright, and Harlan Ellison. Listed in the Who’s Who of American Authors, Bishop was also recognized as one of the seven top writing teachers in the United States. His career in writing and teaching is documented at Boston University in the Leonard Bishop Collection. He pioneered the use of multiple viewpoints and wrote the instructional classic Dare to Be a Great Writer. Bishop published 12 other books, The Everlasting, The Desire Years, Make My Bed in Hell, The Butcher’s, Days of My Love, Creep Into Thy Narrow Bed, Down All Your Streets, The Angry Time, Biography of Maurice Utrillo, Centennial Edition for Southern Pacific Railroad, The Life and Times of William Penn Patrick, and Against Heaven’s Hand, made into the movie “Seven In Darkness.” He also wrote short stories. Leonard Bishop continues to inspire writers and readers. The authors of this site, his family, fellow writers, and students, hope that we help connect you to this powerhouse of a man. A day doesn’t pass — heck, hardly a few hours pass — when I don’t think of something Leonard said. Ornery, witty, dogged Leonard is a big reason I can call myself a professional writer. Thanks for making his essays available online. They’re timeless. Viva Las Leonard!